I hate spam, email spam I can deal with, usually, though it is a pain in the arse when I am out and about, checking mail via my PDA or laptop on a dial up connection. But the spam that hacks me of the most is the spam that has been posted to my blog. Over the last few days I have deleted something like 60-65 spam comments and trackbacks. I have now installed Spam Karma 2, an anti spam filter to the blog from http://unknowngenius.com/blog/wordpress/spam-karma/ to deal with them, I am pleased to report that since installing it I have had no successful attempts to spam the blog. What I cannot understand is the fact that many of the links refer to genuine big corporations, including bookies and online casinos. Do they really think that I or anyone who visits here are going to be impressed that their marketing campaigns including creating spam? I personally will never touch William Hill the bookies or 888Casino ever. They must be completely retarded if they think that spam will increase their chances of doing business. 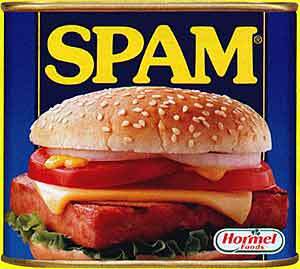 I also hate spam on a completely different level, maybe my palate has changed since I was a kid, I used to love Spam Fritters that were served for school dinners, now I can’t even stand the smell of the stuff.